To fully engage in the Community, clients must be a member of Beauty Insider, SEPHORA’s complimentary loyalty program. This allows clients to reap even deeper benefits and perks through active participation, and to unlock new resources when shopping instore and online. Community evolves and elevates SEPHORA’s current community properties – BeautyTalk, Beauty Board and Ratings & Reviews – with one cohesive experience within Sephora.com, the Sephora App for iOS and Android and mobile web. As part of the shift of all prior properties under Community’s holistic domain, the names of the original properties are updating as well to best reflect their purpose or offering. HOME BASE: The “Home” tab is the central destination for the new Beauty Insider Community. Here clients can build their custom public profile, navigate to preferred Groups, engage in relevant questions or conversations, browse looks and videos from other members and read reviews on recent purchases. PERSONALIZE IT: The “Profile” is where clients can display their personal interests, groups, looks, beauty characteristics, and other community content so they can easily connect with other members. From the profile, they can also review their recent purchases, get personalized product recommendations, promote links to their Instagram or YouTube pages, check updates on their Beauty Insider status, enroll in free Beauty Classes and revisit saved items. JOIN A BEAUTY GROUP: The “Groups” tab (previously “BeautyTalk”) features dozens of themed groups where clients can discover content tailored to their individual interests and connect with like-minded members. Groups range in topics from common skincare interests and concerns such as “Sensitive Skin”, “Makeup is Life” or “Play! by SEPHORA” where members can discover more about the monthly subscription beauty box and share their favorite discoveries. TALK ABOUT IT: The “Conversations” tab is made up of a list of active beauty topics that allow clients to trade beauty tips in real-time, network with like-minded people or search popular conversations. GET INSPIRED: “Gallery” (previously “Beauty Board”) is an interactive photo wall where members can “see and be seen.” Here clients can post and browse looks and videos from members complete with product recommendations. For those looking for a specific look, clients can now filter Looks according to Group topics. 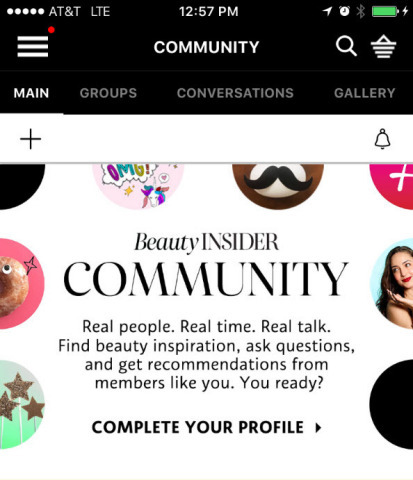 To better connect clients to people with similar interests, product preferences or personal characteristics, Beauty Insider Community is introducing a new feature called “Beauty Matches,” which filters photos and reviews by people who share similar beauty traits. Additionally, launching August 22, Beauty Insider Community members will also have the unique advantage of getting real-time input on products they are considering before moving forward with their purchase. On each product page, members will find a “Live Community Chat” where they can ask a question pointed at fellow SEPHORA shoppers to help validate their decision before checkout.